Clark’s grebe, left, is similar to the western grebe, right, but has white around the eye and a brighter yellow bill (photos by Joe Higbee). Western and Clark’s grebes are closely related picivorous aquatic birds that once were considered different color phases of the same species (Figure 1), and they do occasionally interbreed (Konter 2011). Clark’s grebe was recognized as a distinct species in 1985 (AOU 1985). Western and Clark’s grebes are best known for their elaborate courtship displays, particularly the Rushing Ceremony, in which two birds often appear to ‘skate’ across the water side-by-side with heads held high (Storer and Nuechterlein 1992). Numbers of both species seem to have declined and both are affected by several of the same factors, and a draft WDFW status report for both is in preparation. In summer, these species are found on inland freshwater lakes and marshes in eastern Washington. Western and Clark’s grebes make floating nests from emergent and submergent vegetation, and nesting areas contain at least several square kilometers of open water bordered by emergent vegetation (Storer and Nuechterlein 1992). Western and Clark’s grebes feed on a wide variety of fish, but also will take salamanders, crustaceans, worms, and insects. Fish comprise 80% of the diet and are pursued under water. Males feed their mates large quantities of fish during the period of egg development (Storer and Nuechterlein 1992). During fall, western and Clark’s grebes move to the Pacific coast, with migration peaking in October and apparently occurring at night (Storer and Nuechterlein 1992). In winter, western grebes occupy nearshore marine waters of Washington, but Clark’s grebes are largely found further south. There are few surveys conducted that allow clear coast-wide comparisons of trends concerning western and Clark’s grebes, but available data indicate that both have undergone sizeable declines in the northern portion of their breeding and wintering range. How much of the decline reflects a southward shift versus a population reduction is not clear. Breeding populations. Small populations of western and Clark’s grebes breed on eastern Washington lakes, but breeding areas may be of lower quality compared to those historically available. Systematic surveys of western and Clark’s grebe nesting numbers and reproductive success have not been conducted, but available data suggest possible declines in both species. The combined numbers of western and Clark’s grebes summering in eastern Washington in recent years are probably less than 2,500-3,000 birds, with most of these (1,500-2,000) in the Potholes Reservoir area based on limited data (Table 1). Counts in late August or early September in 2000 and 2001 that tallied 1,900 and 2,200 western grebes at Potholes Reservoir would have included young of the year and migratory birds (Wahl 2005). Repeated surveys have been conducted only in the past few years to assess changes in Washington’s breeding populations of western and Clark’s grebes, and historical data for analyzing population changes in nesting grebes is sparse. A large nesting colony of several hundred pairs present on Moses Lake in the late 1960s was abandoned in 1982 or 1983. Storer and Nuechterlein (1992) indicate that colony locations within large water systems are only semi-traditional, and may change year-to-year with water conditions. Documenting an overall decline requires data from a wider area. WDFW biologists have collected some data on changes in breeding western and Clark’s grebe populations in Washington (Table 1). Counts of at least 100 nests in 2007, 136 nests in 2009, and at least 184 nests in 2011 of both species combined (mostly western) were made on Potholes Reservoir. Similarly, at least several hundred nesting attempts by both species occurred in Moses Lake in the 1980s; but in 2007, only about 100 nest attempts by Clark’s grebe occurred there. 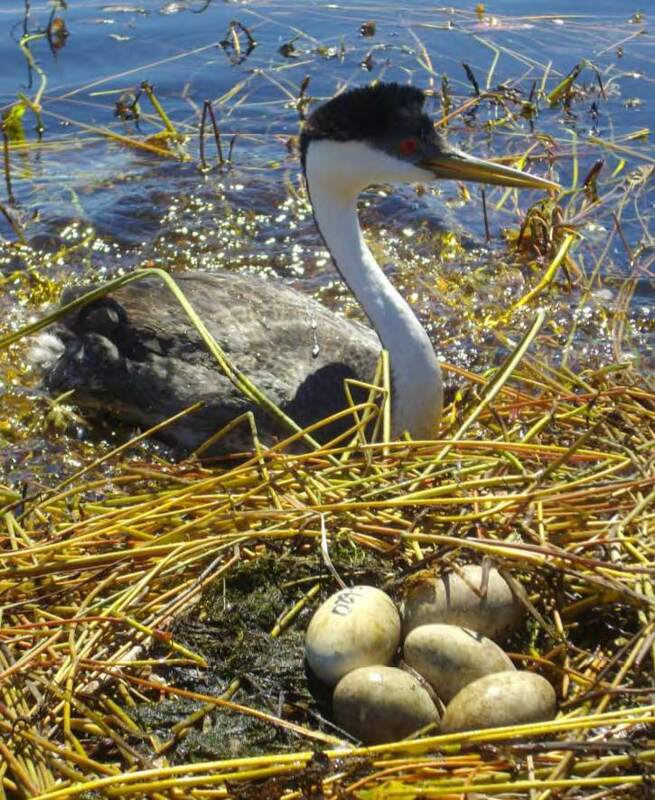 While there is no firm tally of total numbers nesting now, there were clearly fewer western and Clark’s grebes nesting in 2007 at Potholes Reservoir and Moses Lake than in the 1980s and early 1990s. In 2009, at least 64 nests (mostly Clark’s) were recorded at Osborne Bay, Banks Lake; only 2 nests were present in 2010. 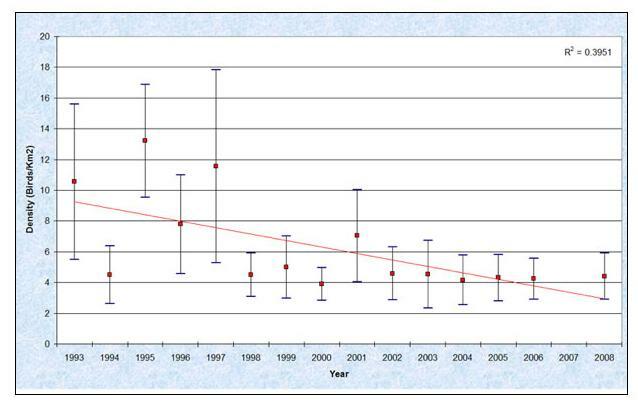 Breeding Bird Survey trends (http://www.mbr- pwrc.usgs.gov/bbs/bbs.html) suggest a decline in the combined numbers of western and Clark’s grebes in Washington, although the decline is not statistically reliable due to a limited sample size (Sauer et al. 2011). 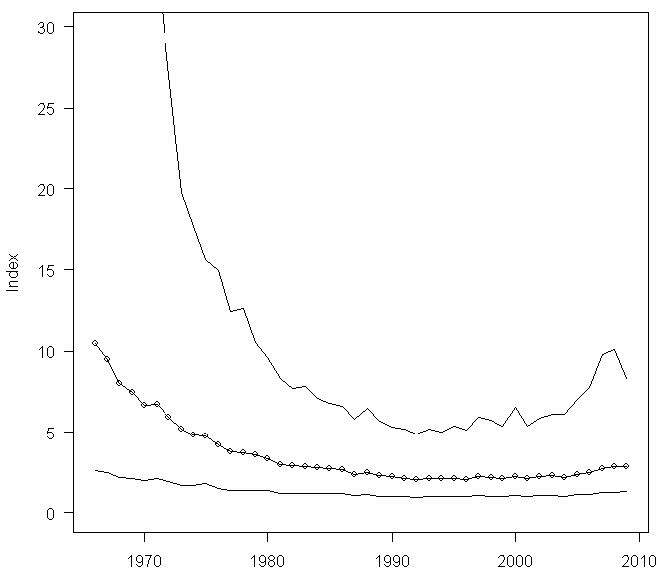 However, the trends for Oregon and the western North American survey area, which have larger sample sizes, also show sizable declines, but with numbers somewhat stable since about 1990 (Figure 2; Sauer et al. 2011). Factors affecting breeding populations. Much of the grebe nesting habitat in the Columbia Plateau is tied to reservoirs that are directly influenced by surrounding water use. The largest known Western grebe nesting colonies in Washington are primarily associated with Potholes Reservoir, the hub of the Columbia Basin Irrigation Project. This project services over 671,000 acres of irrigated farmland in the Columbia Plateau, and as a result, associated reservoirs are characterized by sizable water level fluctuations. During 2012, WDFW biologists made weekly visits from late June to late July to monitor water levels and the Western grebe colony at Job Corps Dike on Potholes Reservoir. Water level change can be a large contributor to egg loss and ultimately, nest failure as anchored nests tend to tip as a result of receding water levels, spilling eggs. During the survey period from 20 June – 18 July, water level dropped an average of 1.9 inches/day from, or >4 ft total. The average water drop between these dates was 2.3 inches/day for the period 2002-2011. A high estimate of 247 nests was made in 2012. Of 49 individual nests monitored, 24 (49%) hatched and 21 (43%) appeared to fail, another 4 (8%) had an unknown fate but were suspected to have hatched. Of the 21 confirmed failures, 29% appeared to be from declining water levels, 24% were from nest destruction (likely from wind and carp activity), 24% from egg depredation,10% from abandonment, and 14% from unknown reasons (R. Finger, pers. comm.). Some grebes compensated by building a lip on the nest to prevent eggs from spilling out. Nest failure due to water level fluctuations might be greater in a more typical year when water levels drop more rapidly. Boat wakes created by recreational fishing boats may affect grebe nesting success (Robison et al. 2008), and requires investigation. Jim Tabor, WDFW biologist in the Columbia Basin for 26 years, suggested that an apparent reduction in nesting numbers since the 1980s may primarily be the result of increased human disturbance. He felt that most other negative factors (e.g., predation, fluctuating water levels) have remained relatively static over that same time. Repeated disturbance by curious boaters, particularly during the early stages of colony formation, can lead to a high incidence of nest abandonment (Storer and Nuechterlein 1992, Robison et al. 2008). Wintering populations. Wintering western grebes have declined by almost 95% in Washington’s inner marine waters since the late 1970s (Puget Sound Action Team 2007). Recent data suggest that numbers may have stabilized since 1998 (Figure 4). Up to 20-25% of the world’s population of western grebes overwinters in Washington. Fish can comprise over 80% of the diet and Pacific herring (Clupea pallasii) can make up more than 50% of their winter diet. The simultaneous declines of wintering western grebe populations and forage fish stocks like the Cherry Point herring, around which western grebe concentrations historically gathered, suggest that changes in food resources have played a role in the decline of wintering populations of this species in Washington. Henny, et al. (1990) reported that western grebes wintering on Commencement Bay, in Tacoma during 1985-1986 accumulated significant amounts of mercury, arsenic, DDE, PCB, and other contaminants. The birds appeared to be in good condition, but the study methods precluded evaluation of sub-lethal effects. Other factors that may contribute to the declines in both species on wintering areas along the West Coast include fishing bycatch and derelict fishing gear. Both species have been killed in gill nets and found entrapped in removed derelict monofilament fishing nets. Western and Clark’s grebes have been killed by numerous oil spills and are considered to be among the marine bird species most often impacted by oil spills off the coast of California, Oregon, Washington, and British Columbia. In the fall of 2009, large numbers of wintering western grebes were killed by a severe algal bloom caused by the dinoflagellate Akashiwo sanguine along the outer Washington and Oregon coasts (Phillips et al. 2011). More focused study and monitoring on the species’ breeding and wintering grounds are needed to understand the causes of grebe declines. Conservation activity. In 2012, WDFW signed a memorandum of understanding with the U.S. Bureau of Reclamation, Ecology Office of Columbia River regarding implementation of the Bureau’s Odessa water project, a long-planned second phase of the Columbia Basin Irrigation Project. The MOU included provisions to establish a Western Grebe Management Area with floating nesting platforms and other waterfowl habitat enhancements. Partners and cooperators: U.S. Fish and Wildlife Service, SeaDoc Society, Washington Environmental Council, Washington Audubon Society chapters. AOU (American Ornithologist’s Union). 1985. Thirty-fifth supplement to the American Ornithologists’ Union check-list of North American birds. Auk 102:680-686. Henny, C. J. L. J. Blus, and R. A. Grove. 1990. Western Grebe, Aechmophorus occidentalis, wintering biology and contaminant accumulation in Commencement Bay, Pugte Sound, Washington. Canadian Field-Naturalist 104(3):460-472. Hoenes, B., and R. Finger. 2011. Summary of Washington Department of Fish and Wildlife colonial waterbird surveys in Grant and Adams Counties. Washington Department of Fish and Wildlife, Region 2, Ephrata, Washington. Konter, A. 2011. Interbreeding of Aechmorphus grebes. Wilson Journal of Ornithology 123:132–136. Storer, R. W. and G. L. Nuechterlein. 1992. Western and Clark’s Grebes. Number 26 in A. Poole and F. Gill, editors. The Birds of North America. Academy of National Science and American Ornithologists’ Union, Philadelphia, Pennsylvania. Phillips, E. M., J. E. Zamon, H. M. Nevins, C. M. Gibble, R. S. Duerr, and L. H. Kerr. 2011. Summary of birds killed by a harmful algal bloom along the south Washington and north Oregon coasts during October 2009. Northwestern Naturalist 92:120-126. Puget Sound Action Team. 2007. 2007 Puget Sound update: ninth report of the Puget Sound Ambient Monitoring Program. Puget Sound Action Team. Olympia, Washington. Robison, K. M., R. E. Weems, and D. W. Anderson. 2008. Western & Clark's Grebe Conservation and Management in California Annual Report for Year Four (2008). University of California, Davis- Department of Wildlife, Fish, and Conservation Biology. Sauer, J. R., J. E. Hines, J. E. Fallon, K. L. Pardieck, D. J. Ziolkowski, Jr., and W. A. Link. 2011. The North American Breeding Bird Survey, Results and Analysis 1966 - 2009. Version 3.23.2011. USGS Patuxent Wildlife Research Center, Laurel, Maryland. Wahl, T. R. 2005. Western Grebe. Pages 81-82, Clark’s Grebe, p. 83, in T. R. Wahl, B. Tweit, and S. G. Mlodinow, eds. Birds of Washington: status and distribution. Oregon State University Press, Corvallis, Oregon.